What is more coveted and sought after more than a Nissan Skyline? How about a vintage 1974 Nissan Skyline 2000GT that’s been done over by “Fatlace” captain Mark Arcenal? Circle get’s the square if that was your guess. At the upcoming San Francisco meet “WekFest” Mark will be officially unveiling the bone stock ’74 Skyline that will be transformed into the rendering you see above (and in the thumbnail below) by Jon Sibal. The Skyline will then be given away to one lucky son of a sandwich in October. Along the way Mark will document the build with pictures and professionally produced video pieces to keep all of us hopefuls updated on the car’s progress. Details on how to enter will be released the day after WekFest on 2.21.11. If you plan on entering then good luck to you because you are going to have a lot of competition! 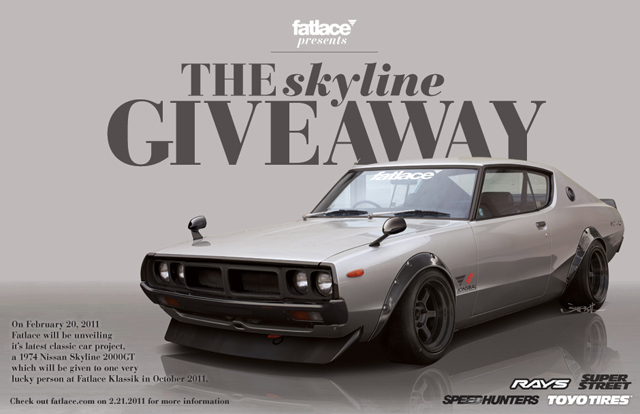 On February 20th, 2011 at Wekfest in San Francisco, Fatlace will be unveiling it’s latest classic car project, a 1974 Nissan Skyline 2000GT which will be given to one very lucky person at our end of year event, Fatlace Klassik. Details will be announced at Wekfest and online the following day, 2.21.2011. We hope to see all of you there and make sure to check back frequently as we drop some sweet video gems of this build. Sponsors: Fatlace, Rays, Toyo Tires, Speedhunters, Super Street, Jon Sibal. Each month, the Skyline will be updated, modified and documented and as it starts its life being a stock body 2000GT Ken & Mary, it’ll turn into this render by the one and only Jon Sibal who I teamed up with to create this masterpiece.